Slumber Party Ao Nang Beach i Krabi, Thailand : Boka nu! Slumber party never fails to deliver. Love it! 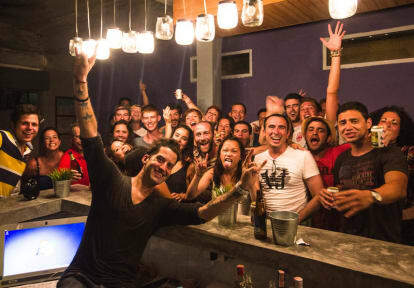 Great hostel to stay at and fun parties. The tours the hostel offers are really worth the money. Would definitely stay there again! 10/10, close to everything. Good place to stay. I am very pleased with this hostel,good mix between party and relaxation. The staff have been fantastic especially Pika and Pam who have been wonderful to hang out with. Highly recommend this!! Amazing hostel and staff! Went on all their daytours and their parties at night, which was fantastic! Loved everybody in the staff, but a special thank you too Teejay and Justin for making this week extra fun! Would recommend everyone who wants to party and have fun to stay at one of this hostels!